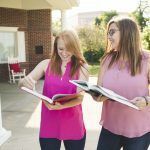 Alpha Sigma Alpha membership education is focused on development in the four primary stages of membership: new member, initiate member, senior member and alumna member. Any initiated collegiate member who wishes to be considered as a big sister must complete the online big sister certification. This program is created to prepare big sisters to serve as mentors, role models and friends to the newest members in Alpha Sigma Alpha. Members who complete the certification are eligible to serve as a big sister for the entire academic year.